After the motor mounts didn't line up the second time we gave up on them. We decided that the rear mount would remain unmolested, but that the driver and passenger side mounts would have to be cut and rewelded. So cut them we did. 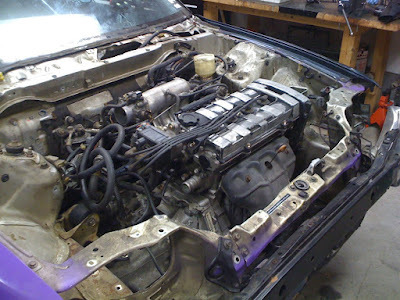 We put the motor back in with just the rear mount holding it and used jacks to support and level the motor. Once we were satisfied with it's position the mounts were cut, ground and tacked in place. We also took the opportunity to check to see if the '95 half shafts were going to work (they did) and to see if we'd have clearance for the suspension (we didn't). So the mounts were welded up and we were able to get the motor sitting in the car without something else holding it up. There's one tweak remaining. The front crossmember needs to drop about .5" to clear the exhaust and give us some more clearance between the engine and the radius rods.